Own one of the most versatile pieces of fitness equipment with an E-Quick Start Guide by Crush Fitness Personal Trainers!! Did you know that some schools are using stability balls as chairs to improve students focus and concentration? Physical therapists are using them with patients to strengthen muscles without putting stress on bones and joints. Stability balls are being used by individuals of all ages and fitness levels. They're fun, easy-to-use and employ the neuromuscular system in a way that no other piece of exercise equipment can. 4'11" to 5'4" height: 55cm ball; 5'4" to 5'1" height: 65cm ball; 5'11"to 6'7" height: 75cm ball. 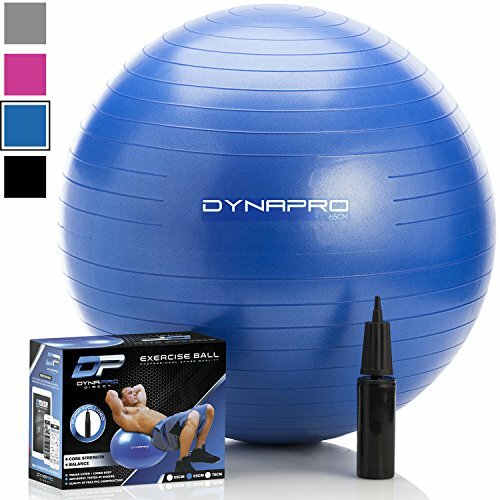 For a low-impact workout with big overall health benefits, add the DYNAPRO Direct Exercise Ball to your cart today. INFLATES QUICKLY AND EASILY WITH HANDY PUMP TO JUMPSTART YOUR FITNESS WORKOUT ROUTINE: Get a quick start on optimizing your health -- every box we ship contains an Exercise Ball that inflates using the hand pump that goes with it. Within minutes, you can use it as a stability ball in any kind of fitness training such as yoga or Pilates, or as a desk chair to correct your posture and support your back when you work. HEAVY DUTY ANTI-BURST RATING CAN MATCH ANY HEAVYWEIGHT: Our Exercise Ball is manufactured using gym quality standards. When used properly, it can carry the stress of heavy loads up to 2000 lbs without popping to prevent you from being injured. Excess loads above this weight will cause the ball to deflate slowly to ensure your safety. NON-SLIP RIBBED BODY STAYS PUT WITH SKIN CONTACT: The PVC body has a matte surface with horizontal ribs contoured all around it -- making it easy to hold without slipping while tossing, bouncing or squeezing the ball even with profuse sweat. FOUR SIZE OPTIONS FOR YOUR COMFORT AND SAFETY: 45cm, 55cm, 65cm, 75cm Not sure which is the right size for you? Our size guide helps you determine which size Exercise Ball best matches your intended use based on your body height if used for exercise, and the desk height if used as a chair. View More In Exercise Balls. If you have any questions about this product by DYNAPRO, contact us by completing and submitting the form below. If you are looking for a specif part number, please include it with your message.